Today marks the 138th anniversary of the birth of the Mahatma Gandhi (b. 10/2/1869). 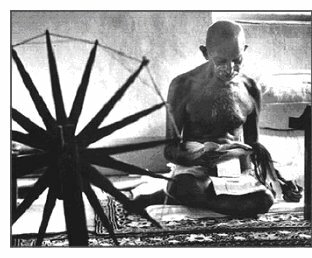 The life of the Mahatma has been widely chronicled (see wikipedia for an excellent set of links for the Gandhi neophyte) over the last 50 years, most notably (and popularly) in the Oscar-winning film Gandhi. So, to save time and reading space, I will not focus on his achievements as an individual. Instead, this is a quick note on how each one of us can make small changes in our lifestyles to the betterment of our culture and our physical environment. In my note below, I will focus on Simplicity. The others are a bit too esoteric for me to cover in this, my first post. Strive for low "overall personal goods consumption". Make a commitment each day, in every way you can, to reduce your consumption of goods, and increase you consumption of ideas. Read your monthly electricity bill carefully. My local utility Southern California Edison for example, has a line item comparing our kilowatt-hour (KWH) consumption from the same period last year to the current month’s average daily consumption. We have a “game” in the family to figure our how we can reduce our KWH usage in small ways. A modest 5-10% reduction is our goal, and we meet it about half the time. Apply the same concept to other utility bills such as gas and water. Look at your “trash haul” each week (or more frequently). Almost every other day, we look at the amount of trash we generate and we are amazed (and disgusted) by what ends up in it. The amount of plastic alone that is pitched out is unbelievable. Most of the plastic we throw out seems to come from discarded packaging of consumer goods that we are attracted to when visiting big box stores. We are now thinking of re-jiggering an old weighing machine to weigh the amount of trash we generate and come up with a simple target number of pounds of trash we should release each week. I am hoping this will drive some of our decisions on what we buy each week. Dry your clothes on a clothesline as long as the weather in your area permits (and not to the detriment of your personal hygiene – i.e. problems with mold in damp climes). This will reduce the ‘cycle-time’ between clothes (as far as discarding old ones and buying new). Consider making a simple drying-rack or rigging up a clothesline from basic items available at your local hardware store. Consume locally grown food as much as possible. I know a lot has been written about this topic, but this point cannot be over-emphasized. Locally grown, “in-season” produce does not sit in warehouses for weeks and is therefore less likely to be treated with chemicals to enhance its taste and increase its shelf life. Shop in local Farmers’ markets as much as possible buying fresh produce. Shop often, as much as twice a week so you are not stockpiling food in the fridge which degrades the nutritional content of produce over extended periods of storage. You know those packets of silica gel that come with electronic gear? The ones that are clearly labeled DO NOT EAT? Same stuff. Here it's used as a gentle abrasive to scrub food and plaque stains from the teeth. Turns out it's not really poisonous. Remember the headlines about contaminated Chinese toothpaste? Bootleggers were using cheaper diethylene glycol, which, like its propylene cousin, is a syrupy liquid that acts as a thickener and moisturizer. Of course, DEG is toxic and sometimes used as antifreeze. Most chemicals in toothpaste taste bitter. Manufacturers could mask this with sugar, but that would kind of defeat the point. So instead, the companies turn to artificial sweeteners — in this case, saccharin. In this case, brisk mint. The taste likely comes from real mint, but the brisk? Probably roasted malt. In 2001, a team of German scientists identified a chemical in malt that tells certain skin receptors to feel "cool." Of course, "brisk" might also come from any number of recently discovered chemical additives that stimulate the cold receptors in the mouth. Sitting down? This is the chemical name for lye. A drain cleaner. In your toothpaste. It's here to neutralize the pH of other ingredients. It may also be one of the main reasons the box warns, "If more than used for brushing is accidentally swallowed, get medical help..."
By way of contrast, look at the list of ingredients in Tom’s of Maine brand of toothpaste. Enough said. Look at what and how much you drive. Is that car trip to the grocery store a mile away all that necessary to just ‘run out’ and get something? Can you think ahead and plan several stops on one trip instead? How about using that old trusty bicycle that has been long forgotten in the nook under the basement stairs. When thinking about buying a house in the happening exurbs of the day - how about taking the long view and trying for once to amortize the added cost of the 20 mile long commute over 30 years, with added modifiers for the time and aggravation of ever increasing traffic? In closing, I just want to reiterate a general point that I think has been made time and again, and in my mind stands as a hallmark of what this Mr. Smith’s blog stands for (at least in my mind). The BLS has reduced ordinary people like you and me to "consumer units". Large industries (not to mention most of Madison Ave.) are devoted to complicating our lives by offering us all kinds of brain candy in the form of consumer goods that will keep us happy.